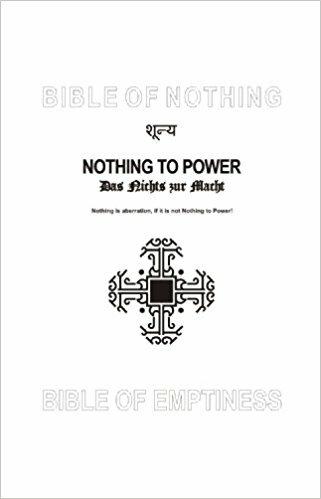 The latest book BIBLE OF NOTHING: NOTHING TO POWER by the world-renowned Russian esoteric philosopher and poet Azsacra Zarathustra makes it clear that the Void like other elements Earth, Fire, Air and Water has a great importance to explore his poetic personality. Here in this BIBLE OF EMPTINESS we find, in compressed form, Azsacra’s vision, and the secret of our destiny. The pages have been intentionally left blank by Zarathustra; the blank pages seem to have the knowledge of the secret of the Void or Zero. Azsacra’s whole attempt amounts to irony on the printed word itself. The elusiveness of the blank pages points out that there can be no conclusive answer to unravel the mystery of the world. In martial arts, we frequently invoke the power of the Void, heaven or sky to connect to the intrinsic creative energy of the world. No doubt, if we get attuned to the occult powers of the void, our soul can be saved from the worldliness in our self. Shunyata (emptiness), unlike "nothingness", is a state of mind. In fact, Azsacra is pursuing Nirvana or salvation that is the end of the world in which all likes and dislikes fade away. Azsacra by leaving the pages unwritten is giving the message that all phenomena is empty. According to Buddha, this is ”the highest happiness”. This can be attained only through enlightenment, not by pursuing impermanent things. Staring at the blank pages of Azsacra’s most original work leaves no doubt in my mind that his whole vision of life is written on these unwritten pages. This is a clear testimony to the fact that Azsacra has said farewell to all inhibitions. We cannot help but feel that these blank pages carry out his philosophy of the void, and they are the proper execution of his philosophical vision and depth. Nietzsche, 1844-1900, in his Thus Spoke Zarathustra aptly says: “No shepherd and one herd! Everybody wants the same, everybody is the same: whoever feels different goes voluntarily into a madhouse." Azsacra has chosen to reflect in a different and most original manner. “Emptiness is illusion, if it’s not Emptiness to Supremacy” “(Azsacra). Here is Azsacra in a very different light. His greatness is shown in the blank pages of the book. For, Azsacra, emptiness is the centre of everything. The words unuttered echo his philosophy very well. The reverence which Azsacra feels for the Void and Emptiness is boundless. Azsacra has succeded in creating a unique atmosphere surrounded by a magic light of emptiness. Azsacra Zarathustra is a well known Russian philosopher and poet-mystic. He is Editorial Advisor for the international journal of poetry and art "Harvests of New Millennium" (India). He is published in India, Tibet, Japan, Germany, Norway, England, USA.